Welcome to the website that, like savebarrett.org before it, aims to advocate on behalf of those dealing with severe and complex adolescent mental health issues in Queensland. After the public rallied in support of the Barrett community over the closure of the Barrett Adolescent Centre at Wacol in 2013/14, it has become evident that this area of mental illness – and the services required to enable those affected to lead the best lives possible – remains largely misunderstood … even amongst the most highly trained mental health clinicians. So our objective is to achieve greater understanding – for all involved. This issue is as severe and complex as the illnesses that it encapsulates. Most people who live and work in this area are simply trying to do their best to minimise suffering and maximise recovery. We join them in that sense of purpose and, in doing so, propose that it is through collaboration that the best outcomes will be obtained. When adolescents, families, friends, carers, clinicians, educators, allied health staff, government representatives, private service providers and the wider community come together with mutual respect, motivated to ensure the best support is available, young people have the best chance to heal. It will provide information on what has happened, what is needed, what is planned. It will share links to other resources, entities and agencies. It will suggest ways – big and small – that anyone can help those who benefit so much from just knowing that people really care. It will try to bring people together – encourage acknowledgement of experience, sharing of information, appreciation of insights. All so that a group of vulnerable people who have previously been (intentionally or unintentionally) overlooked will have access to the kind of help that will make a positive difference to their lives. If any of us can do anything to support those people, we will have done something truly valuable. This site is in honour of Talieha, Will and Caitlin … three shining lights who will never fade. Please note that due to a technical glitch with the Health Consumers Queensland (HCQ) website, the deadline for applications for the available Youth Mental Health Consumer Rep role has been extended to Friday 22nd February. So please continue to encourage anyone you know who might have expressed an interest to put in their application. RSVPs are not required. Those interested are welcome to simply turn up on the day. This event is an informal opportunity to hear from mental health and addictions consumers and carers to seek input, with two other similar events to be held in Townsville and Mount Isa yet to be scheduled. Please download the flyer below and share it with your own consumer and carer networks. Your experiences make you experts. So what lies ahead for people affected by severe and complex youth mental health issues? Of course we can’t know. We can hope. BUT IS HOPE ENOUGH AFTER ALL THAT PEOPLE HAVE HAD TO ENDURE? The people who genuinely understand what “severe and complex” is in adolescence remain a minority. Those who know exactly are those who live it every day. Beyond them, who else recognises that “severe and complex youth mental health issues” defines a unique group of young people? That this is a group whose mental health issues are far from treatable depressive or anxiety disorders. Young people with severe and complex mental health issues experience symptoms, behaviours and triggers that are unpredictable, tortuous, idiosyncratic and often extreme and life-threatening. They are burdened by the challenges of balancing between child- and adulthood – all while they confront the implications of multiple conditions that interact with each other to produce effects that sometimes don’t relate to any one of their individual diagnoses. They can be young people whose traumatic histories have left them socially isolated, traumatised, misunderstood and even ignored for significant portions of their lives. This cohort of patients – as well as those who care for them – MUST HAVE proper recognition. If this does not happen on a wide scale in 2019, then the devastation of the Barrett Closure will be part of an ongoing tragedy. Yes, a new centre is being built which is an incredible relief. And yes, there has been a real commitment to a collaborative design process that includes people with lived experience as well as healthcare professionals and experts in the architecture and construction of mental healthcare buildings. It’s hoped that this will mean the beginning of this kind of process for other healthcare service development. Will this be another year that ends with uncertainty? Will there be the vital outcomes for the families who repeatedly warned that the closure of the Barrett Centre would put the most vulnerable young people at even higher risk? Will there be public recognition of the false administrative deadline, political cost-cutting motivation and lack of appropriate replacement services that meant transitions from the closing centre could never encompass the fundamental principles of stability and continuity of care for young people whose illness bears the risk of fatal consequences? Will there be the long overdue acknowledgment of the few professionals whose understanding and expertise allowed them to continue their dedication to the welfare of traumatised young people with skilled measures that prevented even greater permanent damage? Will there be a move towards wide-reaching processes to educate healthcare professionals about this cohort and the fact that their needs differ from the majority of people requiring clinical support for mental health issues? They will find themselves repeatedly confronted by the futile expectation that treatment that has been effective for those whose illness is less complex and less severe might eventually achieve a modicum of progress. They will stand in Emergency Departments and be told that their compulsion to harm themselves is ‘just attention-seeking’ behaviour. They will be informed by more than one practitioner that they are too complex for his/her level of experience. And then be left with nowhere left to turn. And they will retreat to somewhere where they feel they cannot fail again. But where they will become even more lost. These young people and their families and friends deserve better. They have always deserved the best. But have too often received the worst. They are still often judged and dismissed. Even though they compromise and keep trying to give clarity to what their lives are like and what they need. They slip through the cracks of both healthcare and education. Even though they are desperate for effective treatment and an opportunity to have lives that are even a shadow of the opportunities they see other young people immersed in. The lives of young people with severe and complex mental health issue are hard enough. It takes effort to face a world that terrifies. It takes strength to sit in corridors waiting to give voice to your greatest fears and darkest moments. No one WANTS to expose thoughts and feelings that are deep inside and quashed because an illness has created them but yet for which the sufferer feels personally responsible. Or like a Freak. Or Weird. Or Evil. No one WANTS to stay in a psychiatric facility unless they know that it’s the only thing that can save them. And no person wants to do those things again and again and again because their medication isn’t effective or because their complexity is beyond their current clinician’s experience. But this is the life that those affected by severe and complex mental youth health issues have been living. Not karma. Not punishment. Not of their own doing in any way. It is a health issue. That becomes an emotional issue. A social issue. It affects development and learning and relationships and futures. AND ALL THESE YOUNG PEOPLE AND THEIR FAMILIES HAVE EVER NEEDED IS TO BE TRULY SEEN AND HEARD. SO THE WORLD NEEDS TO LISTEN. AND THEN APPLY THAT KNOWLEDGE. The status quo is not good enough. Not knowing is not good enough. We know 3 young people died after the closure of the Barrett Centre. We know other young people died before them and after them because their severity and complexity was not adequately recognised and supported. SEES these young people and those that care for them. LEARNS ABOUT THEM, FOR THEM AND WITH THEM. AND DOES WHAT IS NEEDED TO GENUINELY HELP THEM. Because we will have learnt absolutely nothing. * This need for clarification extends from those with lived experience to experts in the area of youth mental with extensive clinical and research backgrounds and a genuine understanding of the severe and complex cohort. Orygen, the National Centre of Excellence in Youth Mental Health, is the world’s leading research and knowledge translation organisation focusing on mental ill-health in young people. Professor Patrick McGorry is Orygen’s Executive Director. 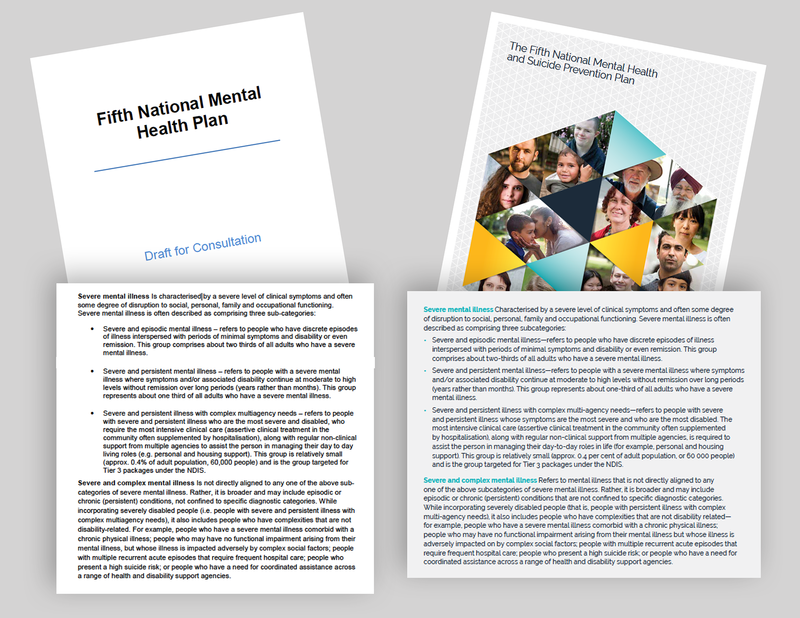 Their official response to the draft version of the National Mental Health Plan highlights a serious lack of clarification as regards severe and complex mental health issues i.e. “Over simplification of the experiences and stages of mental ill-health in the division of ‘complex and severe’ and the rest of the population. It’s also worth noting that in this 74 page document, the word “youth” appears only in reference to the Youth Suicide Prevention Plan for Tasmania (within a list of State and Territory Plans and Commitments). The word “adolescent” appears a total of 4 times (two of those in one bibliography listing) and the phrases “young people” and “young adult/s” do not appear at all. It’s likely to be of particular interest to many for whom child and youth mental health issues are important that Children’s Health Queensland (CHQ) is now advertising a position of some significance. CHQ is the state government Hospital and Health Service under which the facility to be constructed at Chermside following the recommendations of the Barrett Adolescent Centre Commission of Inquiry will operate as one of the many vital options that young Queenslanders can access through the Child and Youth Mental Health Service (CYMHS). The position of a Medical Director of a campus focussing on Statewide Extended Treatment is clearly a key role in shaping how the clinical elements of the Model of Service and Model of Care will be delivered and the right kind of leadership and approach will be influential in achieving the best outcomes for the patients and families who access the services offered at that campus. So there are many people hoping for interest from a substantial selection of high calibre candidates with an appropriate management style and collaboration skills as well as excellent clinical qualifications and experience. With that in mind, this post is to encourage the widespread proliferation of the existence of this vacancy. Because the more people that are aware of this opportunity, the better the chance there is of the appointment of the best Medical Director possible. The person who fills this position will be pivotal in establishing an environment and tone across a service where those elements can have far-reaching effects – not only on those for whom the right support for severe mental health issues can change the direction of their lives but for the team of professionals who will work collaboratively under the leadership of the Medical Director. And although the title accurately indicates the clinical emphasis of the Director, the campus team for such a service would include staff in important non-medical positions (e.g Education, Administration etc.) whose input and mutual engagement with those with clinical expertise must be as valued and intrinsically linked to the goals and values of the facility as any other professional contributor. The right Medical Director will be able to unite all those who stay, work at or visit the campus to create the kind of healing community that provides the outcomes deserved by those affected by the mental health issues the campus aims to address. And his/her leadership and management style will engender a workplace where dedicated professionals with a range of skills and experience will seek to be able to make a contribution when they know that will be valued, stimulating and productive. So there can be no doubt that this is a role of significant opportunity and influence in an area where professional and interpersonal attributes beyond those solely medical will be fundamental. or you can click on the image below to take you there directly. Please share this post and/or the link above as widely as you can. Today was the first day of the inquest into the tragic deaths of Talieha Nebauer, Will Fowell and Caitlin Wilkinson Whiticker. Being overseen by Deputy State Coroner John Lock, the entire process is scheduled to run across a number of weeks, with a number of the parties (i.e. individuals, groups, government bodies etc.) directly involved in the Barrett Adolescent Centre Commission of Inquiry (BACCOI) also represented at these proceedings (in some cases by the same legal counsel). Each young person’s situation will be scrutinised over several days before a final procedure where the collective issues will be examined so as to address the need to consider “opportunities to improve management of the risk of suicide“, as noted in the prioritised issues listed on the Inquest Schedule. whether those deaths were caused by or contributed to or affected by the transition arrangements or the adequacy of care provided by the various receiving services. This earlier post may provide more clarity on the relation of the findings of the COI to the coronial inquest. But it is clear that the Coroner’s office, in holding a combined inquest procedure for the three young people, has determined that the closure of the Barrett Centre must be examined as a factor in the deaths as, tragically, that is the key event that links all three. This will be an extremely challenging process for those who have been emotionally affected by the losses of Talieha, Will and Caitlin and by the closure of the Barrett Centre. To relive trauma numerous times is a debilitating experience and to have to do so in a formal legal arena where events, accounts and perspectives will be questioned by those defending the positions of other individuals and groups will be gruelling. There are many people who have never, and will never, forget them. So may this process provide the answers that these three deserve. Note: Coverage by the ABC Radio’s ‘The World Today’ program can be listened to by clicking here. All reporting on this and on other issues related to severe and complex mental youth health can be found on our ‘In the Media‘ page. LIVED EXPERIENCE has genuinely moved from being a careful phrase to describe those impacted by mental health issues to being acknowledged as a significant asset in the development of all areas of analysis, understanding and treatment of such issues. Those who KNOW having gone from being INVISIBLE to being INCLUDED (thanks to the dynamic work of some very proactive people) and finally being VALUED. And those who’ve been personally affected by mental health issues so often feel that they want to do what they’re able to help others to whom they can relate … it seems that experiencing health issues that can so comprehensively affect your thoughts, emotions and the way you live your life breeds deep compassion. The Lived Experience community is made up of some very strong and empathetic individuals. This is an informal morning tea event to celebrate the opening of the PEER Centre at the Thompson Institute where the focus is on integrating mental health research, clinical services and teaching. It’s a great chance to go and see what the PEER Centre has to offer and celebrate the opportunities the Thompson Institute is creating for people who use mental health services to be proactively engaged in education and research. Expressions of Interest are being sought for the positions of one consumer and one carer member of the Advisory Group to be chaired by the Queensland Centre for Mental Health Research (QCMHR) tasked with developing an Evaluation Framework for the new adolescent extended treatment facility due to commence operation in 2020. As key stakeholders, consumer/carer input is vital to ensure relevance and appropriateness of the evaluation framework from both technical and service user perspectives. It’s anticipated that the commitment will require 3 to 4 meetings of about 4 hours each with all other details available here via the Expression of Interest (EOI) form to be submitted through Health Consumers Queensland (HCQ) via email to Leonie Sanderson: leonie.sanderson@hcq.org.au by COB Friday 12 October 2018. Please phone Leonie on 0437 637 033 for any queries including if you are interested in applying but are unable to submit by this date. Restorative justice is an approach that involves the use of an independent trained facilitator working with people who are victims of violence, and a person involved in committing harm, with the aim of repairing harm. Restorative approaches have been used with success over twenty years in across different systems, including youth justice, education, adult criminal justice, community conflict as well as in other health settings and although they have not been used in mental health and forensic mental health services in Australia, their use has been growing since 2012 in England in mental health and forensic mental health services, and forensic mental health services in Calgary and the Netherlands. The Brisbane North PHN is seeking Expressions of Interest from young people and parents/carers to participate in some focused consultations around their experience accessing child and youth mental health services in Brisbane North region. They are interested in hearing the experiences of those who have accessed child and youth mental health services themselves, or for someone they care for. $80 Gift cards will be offered to young people and parents/carers who are invited to attend. Click here for further information and for the Expression of Interest form (due by Thursday 20th September 2018). For further explanation on the purpose, key questions, process of review and existing services, click here to download a Background Paper with more detail on those issues. This is a unique opportunity to help shape how the new Adolescent Extended Treatment Facility at Chermside will operate along with all the key issues that will ensure it genuinely meets the needs of the young people of Queensland who were failed by the closure of the Barrett Centre. This community has gone from being ignored to being included at ‘the top table’. This Steering Committee makes the decisions on the design and layout of the centre, its model of care, staffing, education component … all the aspects that, if done correctly, will take young people from lives of isolation and continual distress to a place of hope, ongoing support along with independent abilities and skills and having the best chance at a productive adult life with personal satisfaction and achievement. BUT WITHOUT THOSE WHO KNOW WHAT IS REALLY NEEDED, THIS WON’T HAPPEN! 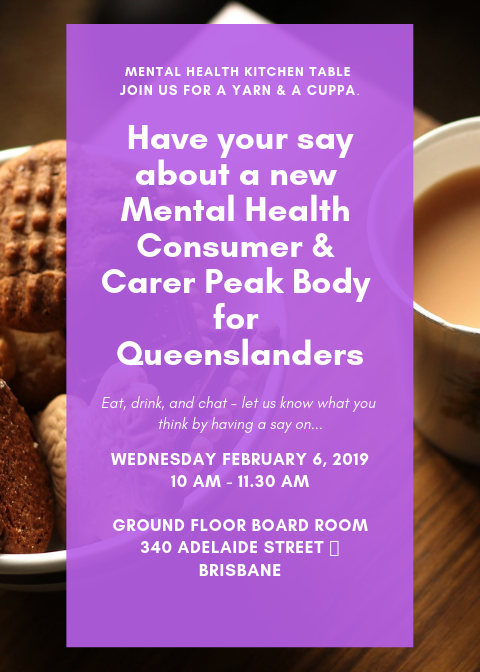 As previous consumer and carer reps can attest, you will be thoroughly and understandingly supported throughout your involvement by Health Consumers Queensland (HCQ) and specialists in mental health. This is not a token gesture, you will be respected and have opportunities to say what’s needed within an environment that acknowledges your personal expertise. You can influence how the centre works and so ensure that young people in need become young people with promising futures. AND, you will receive remuneration for your time and reimbursement of expenses – info here. For more information, you can go to this HCQ web page (i.e. at http://www.hcq.org.au/aetf-steering-committee-consumers-and-carers/ ) and, although Expressions of Interest (EOI) close on Friday 10th of August, if you think you might to apply but you’re unable to do so by this date, you can contact Leonie Sanderson, HCQ’s specialist Engagement Advisor on this issue, (on 0437 637 033 or via email at Leonie.Sanderson@hcq.org.au) to indicate your interest and for assistance in lodging your EOI. So if it’s after the 10th of August when you’re reading this, it may still not be too late. This is a great opportunity to shape the future of adolescent mental health services for those impacted severely. Without those who’ve seen what’s lacking and what happens when that’s the case, the potential to create the most effective new treatment centre may never be reached. YOU KNOW WHAT’S BEEN MISSING, YOU KNOW WHAT’S BEEN WRONG, YOU KNOW HOW THE SYSTEM HAS FAILED YOU … NOW YOU CAN MAKE IT RIGHT! Please consider putting in an Expression of Interest today!